Trilogy is a high-performance, natural skincare range that has won awards and fans the world over because, quite simply, it works. The Trilogy story began in 2002, when founders Catherine de Groot and Sarah Gibbs decided to create natural and affordable beauty products for all ages and skin types. Groot and Gibbs developed their product line by focusing on rosehip oil as both their signature product and the key ingredient in their skincare collection. 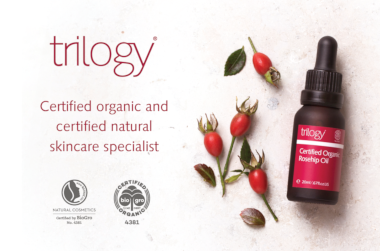 Trilogy's Certified Organic Rosehip Oil is the recipient of many accolades, including Australian Women’s Weekly Product of the Year (2011), Natural Health Magazine Beauty Award (2014), and the Best in Beauty Award by Beauty Heaven (2015). Today's smart, eco-conscious consumers are looking for high-performing, natural products that deliver big benefits. Designed around the trilogy of simplicity, purity, and vitality, Trilogy products contain unique blends of organic rosehip oil and pure botanical actives for real results you will love. The Trilogy range includes body care and haircare as well as facial products to cleanse, exfoliate, and moisturise. The Age Proof range helps combat the signs of ageing, and the Sensitive Skin range soothes intolerant skin. Trilogy takes pride in its commitment to developing effective skincare solutions that are ethically sound, environmentally friendly, and aesthetically appealing. The oil absorbed well but it has a strong almost artificial rose scent which I personally didn't like. There are other rosehip oils that do the same but with a nicer scent. I have used this on my face for 2-3 weeks every day and have noticed such a change. Not only does my skin feel hydrated and healthy, I have noticed my micro-wrinkles around my eyes are gone, bags are dramatically smaller! I also have an old surgery scar that had a bit of a red tone to it, the redness left so quickly after a week of applying!